This is a Texas beer. They say that everything is better in Texas, and you know what, they might be right, as this blonde ale was one of the better blonde ales I have had before. Southern Star Brewing Company is located in Conroe, TX, and if you are like me you have no f'ing clue where that is. 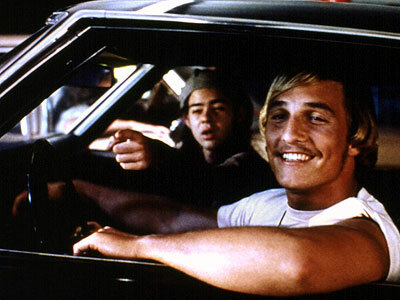 Conroe is about 45 miles north of Houston. I was just visiting Houston these last few days, and it was hotter than a mother there, but I was fortunate to imbibe a few of SSBC's Bombshell Blondes to help cool me off. SSBC was started in March 2008 with 16 oz pounders of a Pale Ale. That followed with the blonde as well as a stout, all in cans. I'm not so sure that stouts in a can are a good idea. The possible metal taste with the stout would be pretty gross. But if it was a chocolate chip cookie flavored metal can, then we'd be in business. Apparently there is a law in Texas that prohibits breweries from giving out exact information on who sells there beers (i.e. they can say that they sell it in Dallas but not what bars/711s/high school concession stands sell it). I'm not sure why this law exists, and I am too lazy to look it up now, but I would have to think that this law pisses off breweries and their clientele. Imagine having a product for sale but you couldn't tell anyone where to buy it? I think the state of Texas needs to go to business school to figure out proper micro-economics. The Bombshell Blonde Ale is one decent beer. 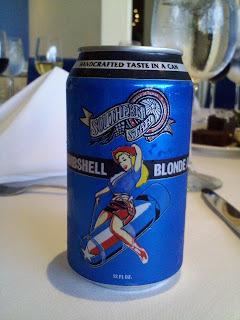 I love everything about the can, the color scheme, the font (style, size, etc), and of course the blonde chick riding a red white and blue missile. Her pose on the missile is totally reminiscent of the scene from Dr. Strangelove, and if you haven't seen that movie, go do so immediately. Or sometime this weekend. Or sometime soon. Really. The Bombshell Blonde Ale has a nice smooth creamy taste to it that isn't very strong or overwhelming, so it would be easy to drink these all night long if you were at a party at the moontower. There isn't much to the taste at all, its pretty weak sauce really, which leaves something to be desired. You can't taste the 5.25% ABV much at all either, adding to its great drinkability. I don't know how much this beer costs, but I imagine it runs in the $8-10 per six-pack range for these new-fangled craft canned beers. If you're in Texas and need to escape the heat, or just want to get drunk (which you gotta do in Texas to keep your sanity), then try the Bombshell Blonde Ale. Its worth your while, pilgrim.